PowerPhrases are a type of mnemonic that will help you instantly recall the Russian words you’ve learned. All language learning experts recommend using mnemonics as a key strategy when learning a new language, and they were essential in helping me recall thousands of Russian words. I’ve developed something I call a PowerPhrase which helps you remember the meaning and the pronunciation of new words. I am a French guy and I have been listening to your podcast for a couple of month now. It helps me a lot since I want to learn Russian as well as consolidating my English. I think your method is great to learn Russian. Can you recommend me a way to do so ? Finally your podcast is only 30 episodes long. Have you been thinking in doing a second part for the podcast ? Thank dear Mark, I learned a lot from the staff or lessons you shared with the world. You and your team are the most charitable guys in the earth i have ever never seen. Fantastic podcast, quick question: how are we to use visual memory aids / mnemonic devices if the Russian word has no English equivalent to associate it to, such as ‘Hoarr Cheche (I want)’. YUCH A CHOO choo train? I want a bike! bystryy which sounds like bistro where you can get a …..quick …..bite to eat. blippity-bloop is the word for “(whatever)”. The brain does not want to be TOLD what a word means. It wants to determine meaning **for itself** by seeing it used in context. THEN, after they’ve learned it, you can ofter a memory prompt…a PowerPhrase like быстро / bistro for quick. Hi ,I love learning the russian language with your mnemonic system! 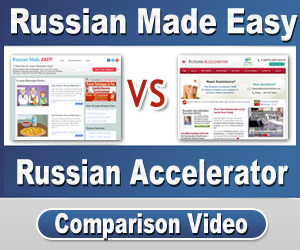 I’m nearing the end of Russian Made Easy and will soon enroll in your Russian Accelerator course. I am curious if you know of anyone using your approach to other languages. Spanish? French? Greek? Really curious about this. Thanks. I know of only one other course that uses my approach: Japanese Method Mastery. I was involved in all aspects of creating the course. and we can notify you when it’s ready. But for all the other languages you mention…No. No other courses that I’m aware of. And I get asked so often, we are contemplating filling that gap. Again, feel free to write us for updates.